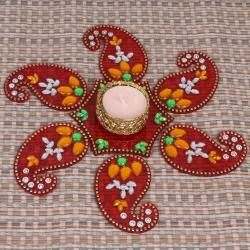 One cannot miss the beautiful Diwali Rangoli designs in almost all houses during the festival of Diwali. 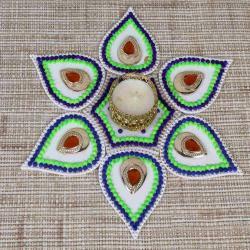 Make beautiful Rangoli designs with our beautiful collections that will surely inspire you. 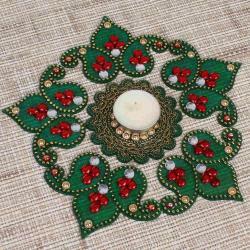 At Giftacrossindia.com you can choose from a selection of materials and designs and add elegance and beauty to your home. 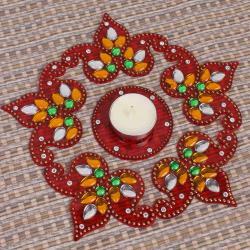 Diwali Rangoli is also a popular Diwali gift and it surely lights up the house of your loved ones. 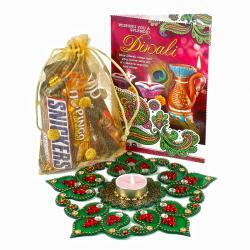 Browse and shop for our exclusive range of Diwali gift hampers online with acrylic Rangoli designs in different shapes and colors. 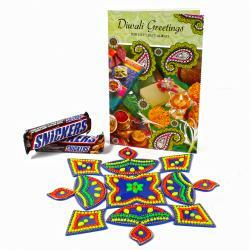 Send your loved ones special Diwali gift of Stunning Rangoli with Diwali Sweets and Diwali Greeting Card online. 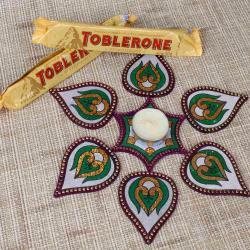 For those who love chocolates, send our specially made fresh Diwali chocolates with modak shape artificial Rangoli and see them light up in spirits. Choose a traditional Royal Rangoli of Small Bells and Mirror studded with mini pompom designs that makes a great Diwali gift for employees, family and friends. 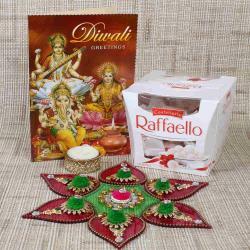 Shop online at Giftacrossindia.com for our exclusive range of Diwali Thali, Diwali Dry fruits and other popular Diwali gifts delivered to your loved ones freshly packed. 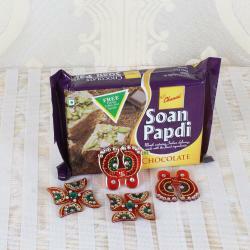 Indian festival s are colorful and its impeccably reflected in different ways. Rangoli is one such illustration that is a special work of art that is made by individuals the whole way across India. 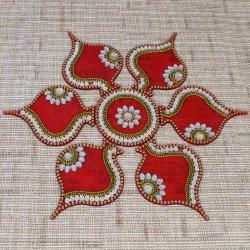 Essentially Rangoli is a work of art that is done floors to embellish houses. The utilization of splendid shading powders with astounding Rangoli plans and examples make its excellent thing for improving homes on extraordinary celebrations like Diwali and events like marriage. 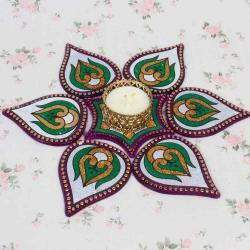 At Gifts Across India we have a fabulous array of Diwali Rangoli designs ! Get inspired from these traditional yet extremely artistic Rangoli designs for Diwali and decorate your courtyard on this auspicious Diwali Festival. 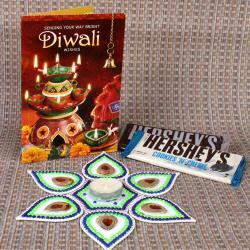 Buy these Diwali Rangoli Designs and make your Diwali more special. 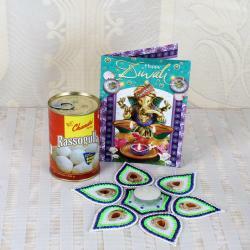 Send Diwali gift hampers like Diwali Diyas with Cakes, Diwali Cards and Crackers and many more with colorful rangoli designs. 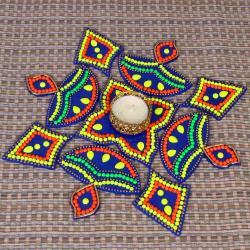 It is the perfect thing for the loved ones not so good in the art of making Rangoli but willing to beautify homes on Diwali with best Rangoli designs. 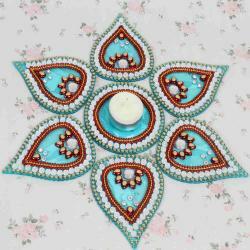 It Can be used as a festival gift and also for home decoration of your own. 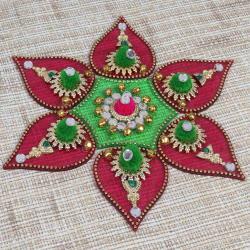 We have varieties of Rangoli designs like Modak Design Artificial Rangoli, Rangoli with Half cut beads work and Stone studded golden imitation piece, Acrylic Artificial Traditional Kuyri Shape Light weighted Rangoli of Exotic Kundan and Beads Work, Royal Rangoli of Small Bells and Mirror studded with Mini Pompom Design and many more.